"My own darling Less, How can you doubt my love for you?" Who the heck is Cleo?! That was a question from a listener who said he's heard every episode of "From Camp Lee to the Great War," but still can't figure it out. If you've also been listening but not necessarily reading all of the accompanying blog posts on Archiving Wheeling dot org, you might have the same question: Who the heck is Cleo? Well, the short answer is that Cleo Hewitt is Wagoner Lester Scott's girlfriend back in Wheeling. We don't know a great deal about her, but to remove some of the mystery, we've created this special edition of "From Camp Lee to the Great War." Let's just call it, "The Cleo Episode." 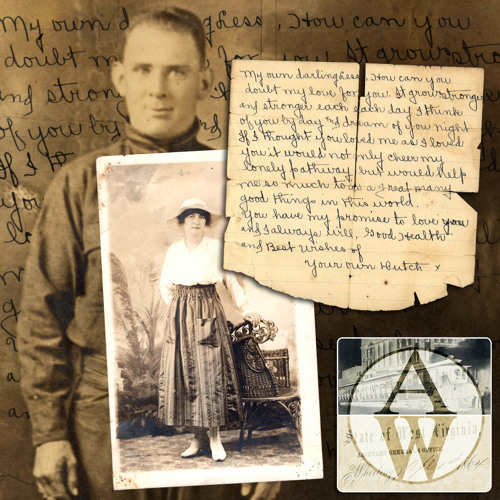 As you know, we publish the letters of US Army privates, Lester Scott and his brother-in-law Charles "Dutch" Riggle, 100 years to the day after each was penned by our soldiers and mailed from Camp Lee, Virginia, back to family in Wheeling. We've chosen to publish the Cleo Episode today because it was 100 years ago last week, on May 23, 1918, that Lester Scott wrote to his sister Minnie Riggle, "please write and tell Cleo Good Bye for me." The reason is, Les knew he was leaving for France. And for reasons that will become apparent, Les wasn't sure Cleo wanted to hear from him. But since his sister was Cleo's good friend, he asked her to convey his goodbye message. After listening today's podcast, you will know as much as we do about the mysterious Cleo. Digital scans and a transcript of Cleo Hewitt's letters can be viewed at: http://www.archivingwheeling.org/blog/from-camp-lee-to-the-great-war-the-cleo-episode Credits: "From Camp Lee to the Great War: The letters of Lester Scott and Charles Riggle" is brought to you by http://archivingwheeling.org in partnership with the Ohio County Public Library (http://www.ohiocountylibrary.org) and the WALS Foundation (http://walswheeling.com). Jeremy Richter is the voice of Lester Scott. Liz Richter is the voice of Cleo Hewitt. Sean Duffy is the voice of Christopher Columbus Scott. The letters of Lester Scott and Charles Riggle were transcribed by Jon-Erik Gilot. This podcast was edited and written by Sean Duffy, audio edited by Erin Rothenbuehler. Music for May 23, 1918 episode: “Poor butterfly,” Jaudas, Eugene. (performer)Jaudas’ Band (performer), 1917, courtesy the Library of Congress: https://www.loc.gov/item/00694036/ Many thanks to Marjorie Richey for sharing family letters and the stories of her uncles, Lester Scott and Charles “Dutch” Riggle, WWI soldiers from West Virginia.